Join us as we celebrate St. Patrick's Day with the Village Runner St. Patrick's Day 5K Run, community walk, and Little Leprechaun Dash for the Gold! All participants will receive a St. Patrick's Day Run t-shirt. There will also be chip timing, age division awards and cash prizes to the top three overall male and female runners in the 5k. 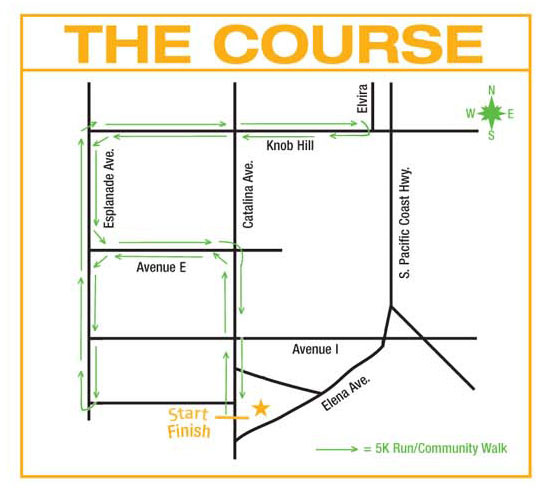 The 5K Run/Walk begins at 8:00am. The Little Leprechaun Dash for the Gold heats are separated by age groups. 9:45am Ages 4-5 Distance: "Dash"
In consideration of my, and/or my dependent's participation in the VILLAGE RUNNER ST. PATRICK'S DAY RUN/COMMUNITY WALK and KIDS DASH, I hereby release and hold harmless THE CITY OF REDONDO BEACH, VILLAGE RUNNER RACING, and all of its sponsors, their affiliates, agents, servants, employees, volunteers, assigns successors, and heirs or distribution and all officials concerned for any acts, omissions, or negligence which may result in any bodily injury (including death) and/or property, loss of damage incurred by me arising out of or in connection with my and/or my dependent's participation in this event. I warrant that I and/or my dependent are in good health and have trained sufficiently for this event. I willingly assume any risk inherent in entering this event. This waiver extends to all claims of any kind and nature whatsoever, whether known or unknown. Further, I grant permission to all of the foregoing to use any photographs, motion pictures, recording, or any other record of this event for legitimate purposes.